Winter is right around the corner- So close you can almost remember the way it feels when the frost bites your cheeks as the wind whips by. With a chill in the air and the trees becoming bare, it reminds us of the warmth that the holidays bring. Warm your hearth and families hearts with a winter retreat and a crackling fire with at one of the remarkable cabins in Gatlinburg, cabins in Pigeon Forge, or Wears Valley cabins offered at Heartland Rentals. Take a peek at our top 5 cabin recommendations for a rewarding winter retreat in the Smoky Mountains. Aspen's Hideaway provides couples with absolute privacy in a rustic atmosphere. This property is absolutely stunning covered in snow. Enjoy a fire inside or outside- Or warm up with a relaxing bath in the claw foot tub. This cabin also features a 4 seasons room where you can relax on a chaise lounge and watch the forest through a floor to ceiling window. *WIFI is not available at Aspen's Hideaway due to being located deeply back on 7 acres of wooded land. *Aspen's Hideaway is decorated for Christmas! Mountain Mist is a private, cozy log cabin which rests high on a mountaintop, nestled between Gatlinburg and Pigeon Forge. A private, secluded screened in deck off of the bedroom makes the perfect place to enjoy a cup of coffee in the morning while watching the frozen dew fall from the trees through the sunshine. *CABIN IS DECORATED FOR CHRISTMAS! This amazing 4 bedroom, 3 bath Cabin with comfortably accommodates up to 8 people. Buzzards Roost is between Pigeon Forge and Wears Valley making it easy to get to town but just far enough away to offer its guests privacy from the hustle and bustle. There are picturesque views of the Smoky Mountains from the deck of Buzzards Roost. The views can even be seen from the top level while playing a friendly game of pool. God's Grace is a tri-level cabin with 2 bedrooms and 3 baths boasting remarkable views. You are greeted with charm from the minute you approach the front door. 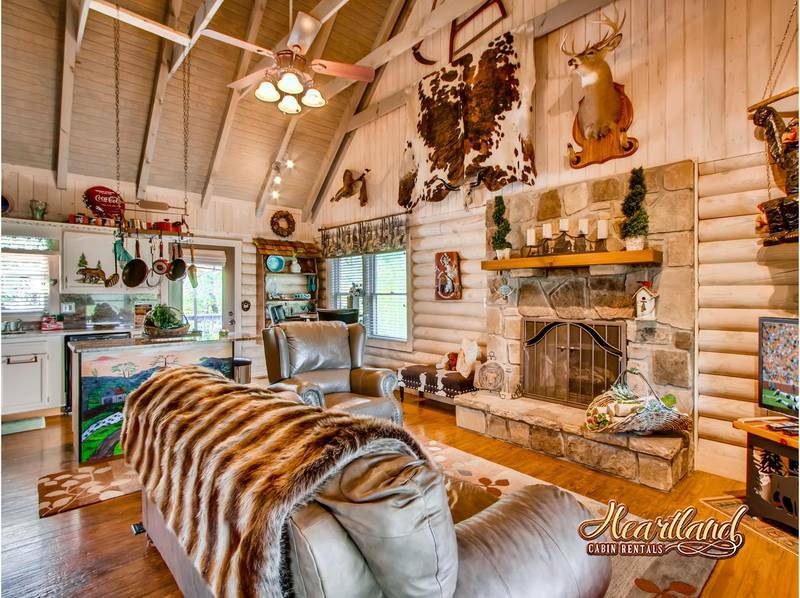 This cabin features rustic craftsmanship adding a woodsy personality to the home.